We have a fine Apricot in our garden, and we have achieved excellent results. Here is a summary of what we have learned over the years. It’s easy to grow. It has to be on a South-facing wall; it will need a space of approx. 6 to 7 metres wall length (this length can be shorter, but in this case, more summer pruning is necessary.) The planting hole needs to be thoroughly prepared. Use John Innes tree planting compost and make sure the tree is not exposed to a leak in the a gutter. It’s important to provide thermal protection for the tree from mid February to the end of May. Fix large-size shelf brackets to the wall above the apricot tree and construct a wooden shelf. Use this to fasten a double layer of fleece each year around the second week of February. Cover the entire tree, and make sure the wind cannot blow it off at any time. Lift the fleece during the day only, when the tree is in flower, sp that pollinating insects can carry out their work. All this is necessary because the Apricot is very sensitive to frost. In addition, until leaf starts to develop, it is sensitive to “peach leaf curl” and bacterial canker. The great thing about apricot growing is that you do not need to use any chemicals, if you protect the tree as outlined above. While the tree loves organic matter around its base, it’s important to keep it away from the trunk. It hates the grass around its base, so mulch the tree well, in order to keep grass and weeds at bay. Never let the tree struggle for moisture, and thin the young fruitlets when the size of a large pea, spacing them to at least 4 to 5 inches apart. Pick the fruit when turning yellow in August. At this stage, flavour will have developed well. 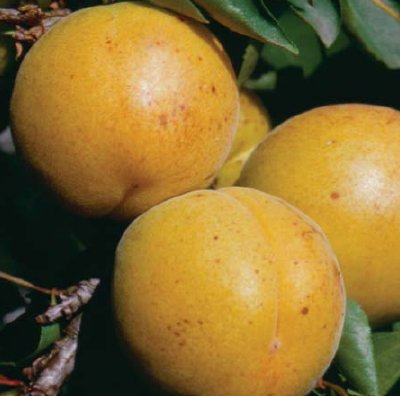 An apricot should never be pruned during the winter months, but always when there is a full canopy of leaves. Start with 2 side branches. Cut these back by about 2 inches. Remove all other growth (March). Promote strong growth by ensuring that there is sufficient water, nutrients and warmth (using the fleece as detailed above). Seal all fresh pruning cuts with “Heal and Seal” compound. This protects against bacterial canker. Select 2 shoots on either side. Tie in with bamboo canes at 45 degree angles. Cut the original side branches and the extra 4, back by about a third of their length. Continue to feed well (slow release fertiliser, Osmacote or the equivalent). Select the final 2 branches, and carry out the same procedure as in the first year. After cropping, cut out the wood that carried a crop (i.e. in August). Tie in new canes to replace the wood that carried fruit. Apricot crops best on younger wood. Never prune apricots during the winter months but ALWAYS as soon as you have picked the crop. This helps to avoid disease from developing. The same applies to plums, cherries, apricots, peach and nectarines. It is important to remember that apricots tend to over-crop, and this leads to having too much crop one year and not enough the year after. To prevent this, you should observe the 1-year old wood of fully-grown healthy trees. If there is an abundance of blossom on this wood, then this wood needs to be cut back before the blossom has a chance to set fruit. Secondly, once the size of the best young fruits has reached around 10mm, it is the right time to seriously reduce the number of fruits. Bring back bunches of fruitlets to singles and space the fruits 6 to 8 inches apart. Always retain the largest fruits. Continue to foliar feed the tree, and water the tree during the summer months. A shortage of moisture during the summer will affect the quality of the fruit buds the following year. If any summer pruning needs to be done later during the summer months, remove strong-growing surplus laterals. Do not cut out any new shoots which have closed down early. These usually carry the best fruit buds for the following year and therefore should be retained. 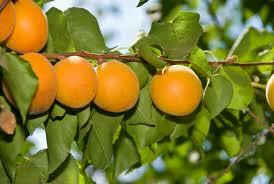 We can supply apricot varieties suitable for growing in the UK. Click here to go to the tree varieties page, where you can use the web form provided to ask for any additional information you may require with regard to your order.